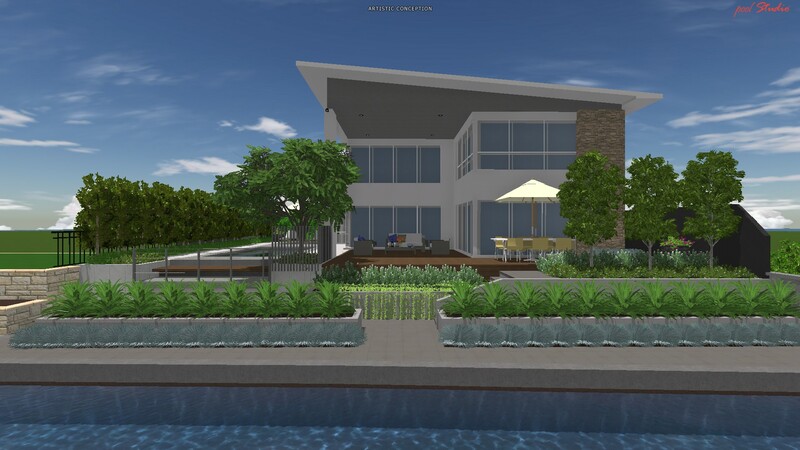 coastal garden | House by the water. In order to limit our landscaping costs and because we like gardening, we are planning and planting the trees and plants ourselves. The garden is a long way off but already we’ve been keeping an eye out for suitable trees. 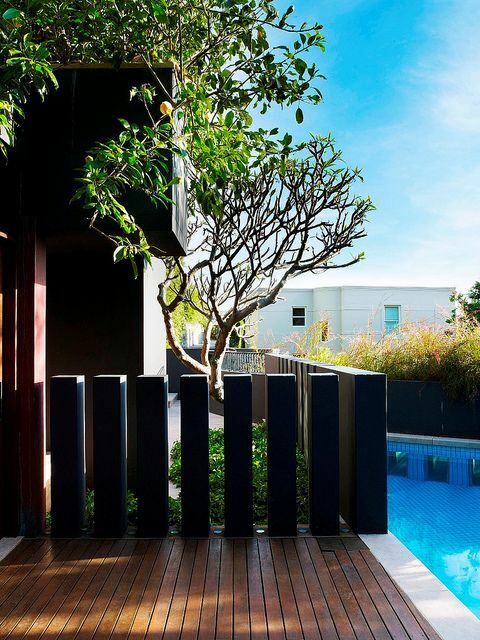 I’ve been scouring Houzz for good looking gardens by West Australian landscape companies. Houzz is very useful because the landscape companies often give details about the products and plants that they use. 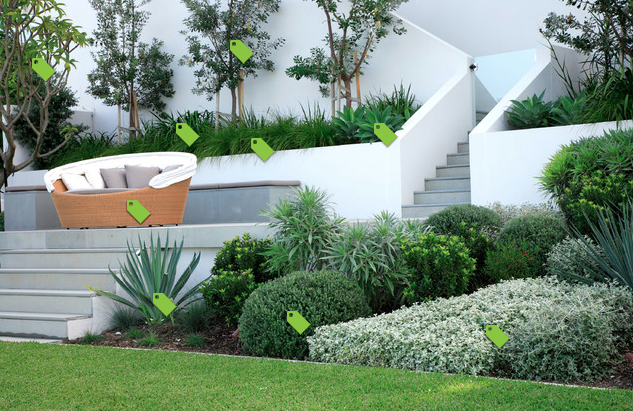 Fully labelled photo – scroll over tags in “Houzz” to see the name of each plant or product. Landscape design by Secret Gardens, photo via Houzz. Surprisingly, recent real-life inspiration came from Parliament House in Canberra. The landscaping there is beautiful. Orderly without being stark. There is a distinct colour scheme of grey and green. The outstanding feature is a grove of birch trees. 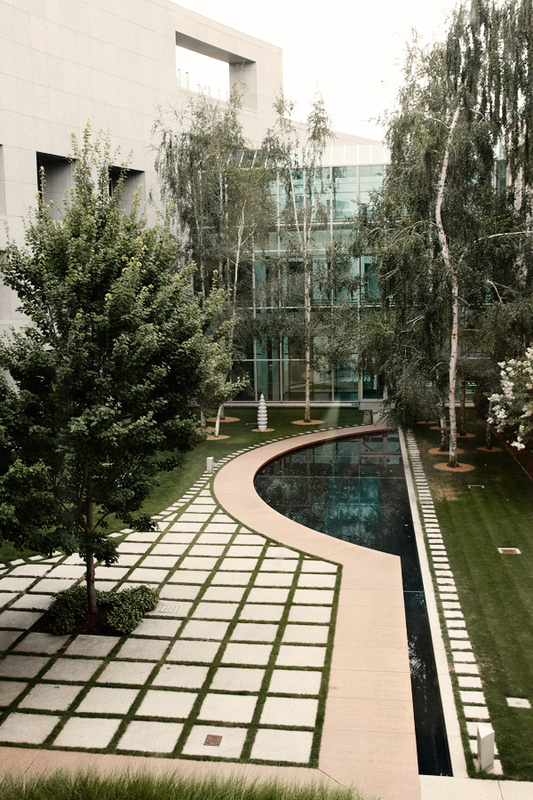 A courtyard at Parliament House, Canberra. Photo courtesy of Swah from Love Swah. Let’s start at the back (canal-side). Trees for the canal side of our block. Landscape design by Tim Davies Landscaping. We need one feature tree, a row of 3 narrow trees and a poolside row of pleached trees. shade the outdoor lounge area from the Western sun. tolerate coastal conditions including wind (and sandy soil?). have roots that are containable to a small area (pool and pavers are nearby). This picture is fairly close to our landscaping plans. Upright fencing, decking and pool. But, we need more shade. Source: William Dangar and Associates, via Flickr. Frangipani (Plumeria). Shortfalls might include inadequate shade and wind intolerance. Magnolia Kay Parris. Might need wind protection. Chinese Tallow. Due to invasive roots, I think it would need to remain potted. The leaf drop in the pool may be yuck. Olive. Not quite in the beautiful category when planted in isolation. A healthy Frangipani offering shade. Light on foliage, to keep the view. Banksia Integrifolia (pictured at the top of the post in the Houzz photo). Picture sources: 1. C.O.S. Design via Houzz. 2. Swan Architecture via Houzz. 3. Abor West Tree Farm. 4. Tim Davies Landscaping. “Designer ash” (Fraxinus excelsior “Nana”). Now to the front – here it is simpler. North facing, more protected from wind and with more room to grow. 1. Feature tree near front entry. I think we’ll match the feature tree from the back, whatever that might be. 2. Orchard around front yard perimeter: This one is easy – olives and citrus trees, maybe a bay tree to complete the cook’s garden. We’ve had olives and lemons in Mandurah before and they grew like wildfire. Bay tree in herb garden. Picture sources: Olives – Charlotte Rowe, Bay tree – Penny Woodward, Lemon and limes – Abor West Tree Farm. Midway through my list making, my husband asked whether I could really mix native trees with non-natives and still keep to a single landscape style. Despite the fact that he was only voicing what I had been wondering, I was annoyed that he was adding to my tree dilemmas! Further web trawling has given me the confidence that mixing trees and plants can be done well. (The top picture is a good example.) So my answer is now, yes! The subject of trees certainly opened up a can of worms. I’m not sure that I’ve concluded anything yet, but hopefully this post will encourage some advice from green-thumbed readers, particularly those in the same climate as House By The Water. At the very least, I now have some short lists to take to the tree farms or local nurseries to seek further advice.